Youth Charity UK – The Accumulate story and how it all started from Jam!. The Accumulate Story and how it all started from Jam!. You are here: Home / The Accumulate Story and how it all started from Jam!. This is the Accumulate (previously Accumul8) story and how Marice Cumber started the Accumulate project – with pots of jam. 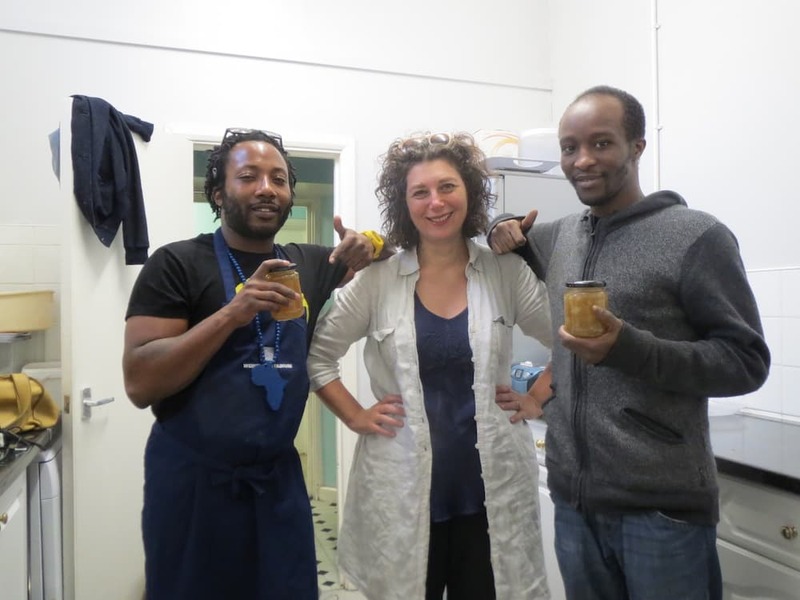 These are the Preserves with a Purpose – jams and chutney from discarded fruit and made by her and a team of volunteers and which helped to pay for the first series of Accumulate creative workshops and activities at hostels for young people who are homeless. It all began in July 2013, when the North London YMCA hostel contacted Marice, who is a founder of the Crouch End Festival, as they wanted to explore ways that the two organisations could work together to join the skills and talents of local artists and craftspeople with the creative potential of the young, homeless people living at the hostel. A meeting took place with the residents, and together they planned creative workshops at the hostel with the idea of producing work for an exhibition at Crouch End Festival, and so Accumulate was born. Accumulate has moved on from making jam to pay for the workshops and now independently fundraises to provide creative workshops at eight hostels across London. 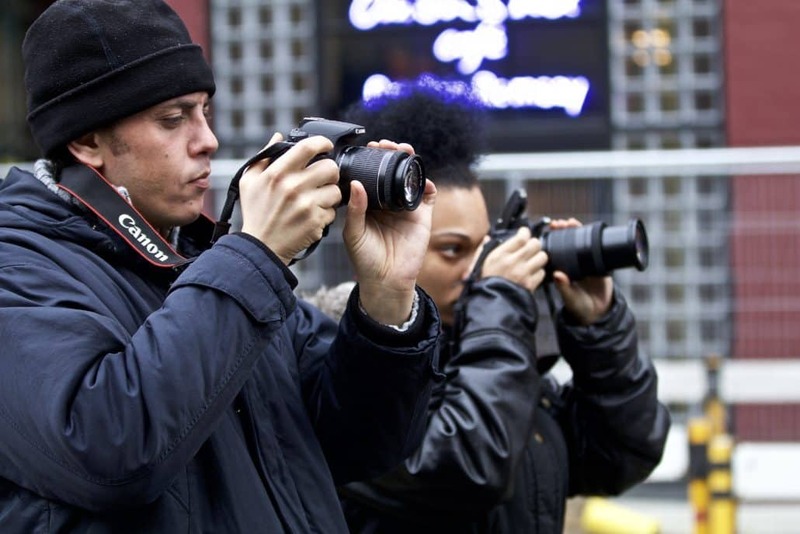 These workshops, covering photography, film making, creative writing, illustration, textile printing and jewellery, are taught by Ravensbourne College tutors and students and the workshops take place in different locations across London, including Tate Modern, The Barbican, Somerset House and The Photographers’ Gallery. The results for the residents have exceeded all expectations, with participants’ creative work featured on tv and in national newspapers, shown at exhibitions and purchased by the public. Fitsum and Shona on a Southwark Street Photography Shoot. The Accumulate project and project journey is a rewarding experience for all – the residents, Ravensbourne students who assist on the workshops, plus the tutors and facilitators. Everyone is learning, collaborating and achieving together, new friendships are made, boundaries crossed and skills built. Accumulate really shows what can happen through creativity, collaboration and the community working together and the positive and lasting impact it can have on people’s lives, aspirations and future. In 2016, we created the Accumulate scholarship for one participant to study Creative & Digital Media at Ravensbourne. This year, the Accumulate Scholarship was awarded to Sam Adesanya, previously resident at North London YMCA Hostel, now living in independent accommodation, working at The Picturehouse in Crouch End and a student at Ravensbourne – a true Accumulate success story. In 2017, four Accumulate participants were awarded Accumulate scholarships to continue their creative learning, change their lives and become a student at university. This Accumulate Evaluation was produced by BOP Consulting and shows how Accumulate creates impact and improves people’s lives. I would like to tell you about my experience of the Accumulate Project which was created by Marice Cumber. I’ve been part of the Accumulate project for over two years. Before I was a part of it I was stuck in a prison of a hostel. Days were tedious and mundane. It is hard living in that sort of environment where everything is stifled. Creatively I was wasting away. However, this all changed when I heard about the Accumulate project. Before I knew it I was whisked out of the hostel and taught photography. Through Marice, I met Othello and others who taught me about aperture, F-stop the relationship between light and dark and various other things. Marice then gave us as a group a chance to show our work within an exhibition, something which I’d not only never done before, but also something which I had never even considered. Eventually by keeping up with the project we were given the chance to actually exhibit our work within the Guardian building in King’s Cross. I even got on ITV2 and London Tonight and in the local newspapers. I was ecstatic as I was seeing the seeds of my photography, seeds which Marice and others had planted, bear fruit. The best moment for me came when I was awarded a scholarship award to go to Ravensbourne college. I had previously visited the college with Marice and as soon as I did, I fell in love with the place. That when I made up my mind that I would go to Ravensbourne by any means necessary. With help from Marice, Othello and my own willpower, I’m glad to say that I now attend Ravensbourne college studying HE Design and Digital Media. I hope to get a distinction and progress into the undergraduate programme. When Accumulate was offered to me I was going though quite a bad time I just had to leave my college course and so had nothing do for about 6 months. Photography has been something I have always been interested in, I did some small courses while I was in secondary school but was never able to actually continue it. Accumulate took me to many places that I had not been to around London which was very nice, we were able to meet new people and speak to and work with different companies. For instance going to The Photographers’ Gallery just off Oxford Street, meeting two up and coming fashion designers and going to London Fashion Week with them and taking pictures (this where most of my exhibition photos came from), shooting a band and the Camden Roundhouse. All of these things made me think about the things you can do in the future. I can only thank and appreciate all the people that put their time in giving me something amazing to do during those months, if it was to happen again I would do it in an instance.